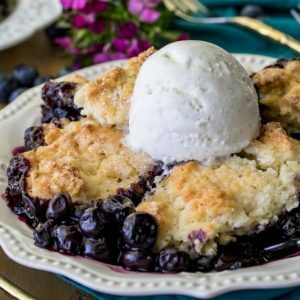 Blueberry Cobbler is a sweet summertime dish made with freshly picked blueberries (the frozen variety will also work too, though!) 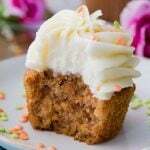 and topped with a sweet biscuit-like topping. This dish is best served warm, topped with a hearty scoop of vanilla bean ice cream! 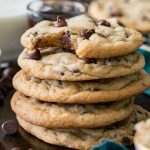 Recipe includes a quick how-to video! I already broke down and turned the air conditioning on this week. I thought I could make it at least until June, but while I could handle a few days of intense humidity, my baking absolutely could not. I lost two cakes and a batch of cookie bars to the humidity. A pound and a half of butter that I set out to “soften” melted all over the top of my refrigerator. The butter I kept frozen for this Blueberry Cobbler started to disintegrate in my hand after less than 30 seconds out of the freezer. While you won’t regularly catch me complaining about summer weather (I like to get out all of my weather-related complaining in the winter), the butter casualties got to be too much and so the air conditioning is on, at least until I finish my baking for this week. One good thing about all of this heat and humidity? 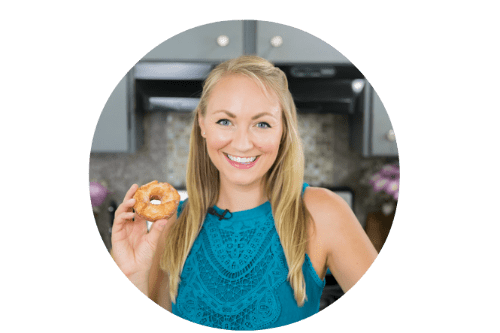 It’s officially berry season and the perfect time of year for fruit-filled sweets like strawberry shortcake (have you made yours yet as part of the recipe of the month!?) and Blueberry Cobbler! Cobblers are made of a fresh (or frozen) fruit filling baked in a baking dish and topped with a sweet biscuit-like topping (which, you may have noticed, has a very “cobbled” appearance). 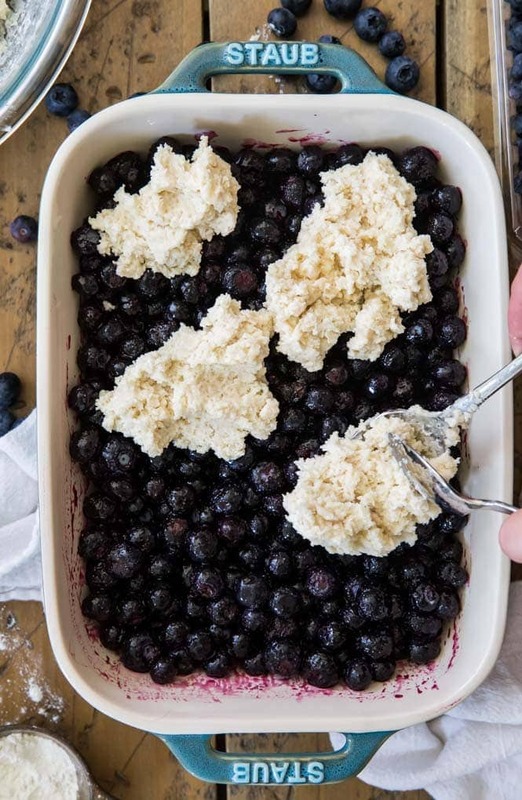 Today’s recipe is made with a simple blueberry filling — you’ll just toss together your blueberries, some sugar, lemon juice, and corn starch and transfer that to a baking dish before topping with the cobbler topping. Today’s Blueberry Cobbler topping is based off of my homemade biscuit recipe but is sweetened more like my strawberry shortcake layers, so if you’ve made either of those recipes before you already know how simple they are to mix together! 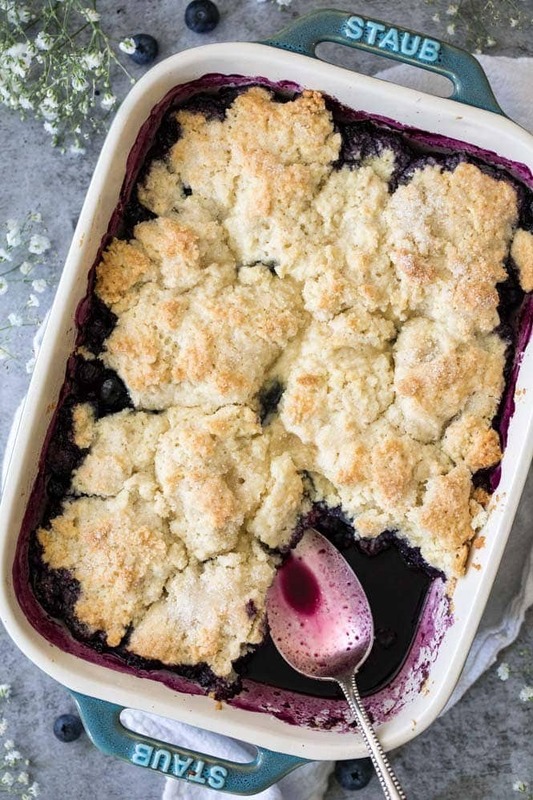 Can I use frozen blueberries for Blueberry Cobbler? Yes! 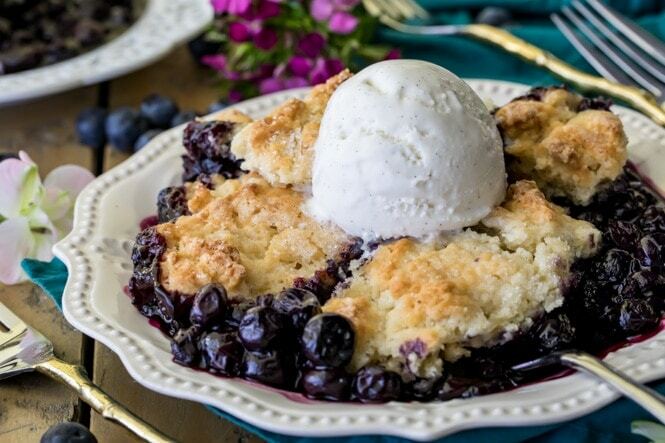 This blueberry cobbler recipe works great with either frozen or fresh blueberries. This particular blueberry cobbler will need to bake for about 40-45 minutes total. You’ll start by baking uncovered for 25-30 minutes or until the top begins to turn golden brown. Once it starts to turn brown, cover the cobbler with foil and continue to bake an additional 10-15 minutes or until the center is baked through (depending on how you distribute your topping, it could take more or less time). I recommend using the toothpick test to make sure your cobbler is baked completely. 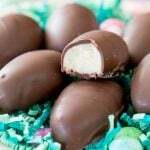 To do this, insert a toothpick into the center of the biscuit topping and insert it down to the blueberry layer. 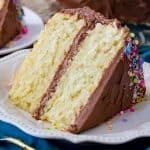 It should come back out without any wet batter from the cobbler topping. While the blueberry cobbler is still warm the filling will be very liquidy, and I do recommend serving it warm. I like to scoop out my cobbler serving, top it with vanilla ice cream, and then use some of the leftover cobbler juice from the pan as a blueberry sauce to pour over my ice cream. Coarse sugar for sprinkling if you don't have coarse sugar, regular granulated will work just fine! Preheat oven to 425F. In a large bowl, combine blueberries, 1/4 cup sugar 1/4 cup brown sugar, lemon juice, and corn starch. Stir ingredients well and then pour into a 7x11 baking dish. 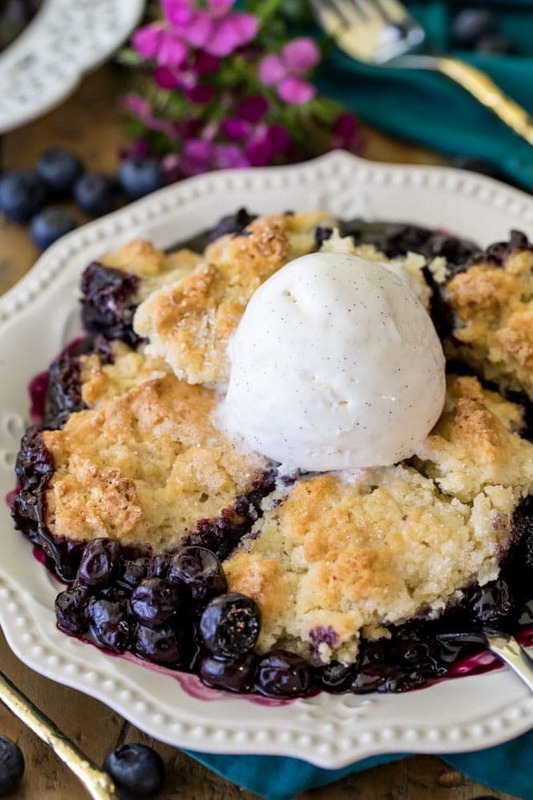 Set aside and prepare your blueberry cobbler topping. 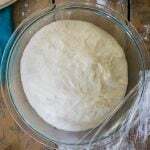 In a separate large bowl, combine your flour, sugar, baking powder, and salt in a large bowl and mix well. Add heavy cream and milk and use a wooden spoon or spatula to stir until ingredients are combined (don't over-mix). Use your hands to evenly drop and distribute biscuit mixture over the blueberry filling that you prepared earlier. The biscuit batter does not have to totally cover the blueberries, just do your best to evenly distribute it so that it will cook evenly. Transfer to oven and bake on 425F (220C) for 25-30 minutes or until top is golden brown. 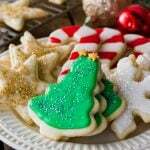 Cover cobbler with foil and bake an additional 10-15 minutes or until a toothpick inserted in the center of the biscuit portion comes out clean or with a few dry crumbs. 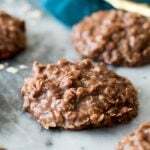 Allow to cool for about 10-15 minutes before scooping and serving warm. Top with vanilla ice cream, if desired. 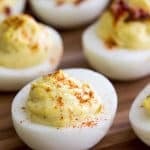 *For best results, chill your butter in the freezer for 10-20 minutes before beginning this recipe. 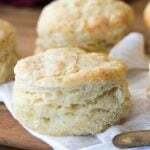 It's ideal that the butter is very cold for light, flaky, buttery biscuits. A chilled metal bowl will also make whipping your cream easier and faster, so while it is not mandatory it would be helpful to place one in the freezer at this point that you can use for your whipped cream. 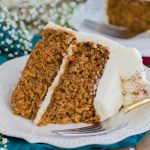 Next Post June Recipe of the Month!